I've played a bunch of controller-free Kinect games (and watched Crecente dance through one!). Some are cool, some familiar. Some are a little broken. But two bits that I've experienced were spectacular teases about how Kinect can excel. 1) The Angle Of My Arm: My favorite Kinect game of the handful I have tried is Ubisoft's workout program Your Shape: Fitness Evolved. It's not that I crave fitness programs, but that I was smitten byhow the Kinect, well, connected me to this game. Like other Kinect games and programs, it uses the new Xbox 360 sensor array to detect my presence in front of the TV and track movements of my body. Unlike many of them, it shows me a version of myself on my TV. During a demo of the game earlier this week, I appeared on a TV as an orange silhouette that was shaped, in real-time, to match the contours of my body and clothing. Almost instantly, Your Shape started measuring me. It checked my height and displayed that number near my silhouette's head. I saw a number appear near my hand and realized it was showing me how many inches my hands was above the floor. I raised my hand and watched the number change. As I extended my arm out from my side I saw a new number that indicated the angle defined by my arm and body. In my 33 years on this planet, I've been told by workout instructors and doctors and who knows who else to hold my arm out at a 90-degree angle or some other measurement. I've always just guessed, assuming we could be content with our inability to easily know if I had followed directions to the perfect degree. Ubisoft's fitness game, however, can reveal the numbers. It shows the math and displays some stats that have never appeared near my body but like age or weight are relevant to my physical form. I liked that a lot. It felt Star Trek. It's as if something that has always been quantifiable — some aspect determined by my body and the way I move — finally can be measured. And I can see it. That, thanks to Kinect, is a great effect. 2) Barge-In, Barge-Out Multiplayer: The people who make the Forza games for the Xbox 360 have been experimenting with Kinect. They want to release some sort of Kinect experiences/games/modes in the future. One of the things they showed here at E3 was a driving challenge that has one player at a time standing in front of their TV, arms held out, steering a car down a highway. Acceleration and braking are automatic. You just rock your hands to steer, as if you were holding a steering wheel. The goal in this challenge mode is to pass as many cars on the road as possible before a timer expires. Once you're out of time, you get a score and can start it again. The nice things about the Forza passing demo are that it is simple, fun and, best of all, easy to jump in and out of in a party situation. Simulating that kind of gathering during a demo of the Forza Kinect experiences earlier this week, the developers were able to let me try the passing game, then step off and have someone else take their spin at it. Kinect recognizes new players in an eye-blink, without any noticeable pause to recalibrate. It finds the new player's hands and just works. These kinds of party-friendly pass around games often require a transfer of a controller. I pass you the Xbox 360 gamepad or you take off the Rock Band guitar and I strap it over my shoulder. This Forza passing demo showed how Kinect can beat that. We're talking about an experience that is as simple as me stepping away and you stepping in. That is how I'd like to play games at a party, the situation where I think I'd be most interested in "controller-free gaming." There were some other interesting Kinect experiences. I liked swiping my hand to navigate the Xbox 360 dashboard and got a kick out of counter-steering in Joy Ride using my hands and hips to turn against a power-slide. The standouts were the two features I mentioned above. Of the half of the Kinect line-up I tried, those were my favorites. 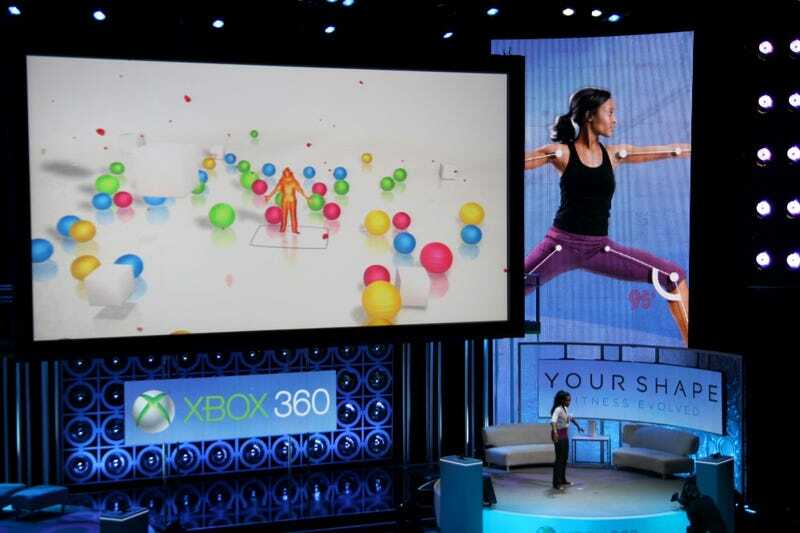 Look for more Kinect impressions from the Kotaku team as E3 2010 rolls on.